Featured Blog #16 I hope I made the right decision for featuring Edmar's site in FBW. Seriously, the site is one of the best Travel blog in the Philippines, very informative and entertaining. 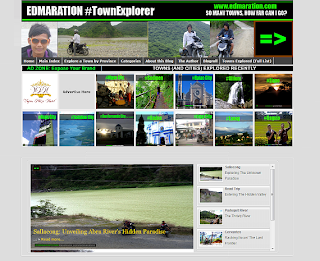 Blog Description: EDMARATION #TownExplorer is a motorcycle adventure travel blog of a practicing Pinoy Nurse in the Philippines who calls himself as "The 1 Day Town Explorer" exploring towns with his motorbike usually within 1 day. The blog aims to explore all the towns in the Philippines by using a motorbike particularly (or any other means) and make a blog post to every town visited. This blog is set to feature 1-day itineraries to every town so that readers will have an idea on how to explore a town in 1 day especially for those travelers who only have limited time to travel like him. Edmar is a 24-year-old practicing nurse by profession, an off-road motorbike rider, adrenaline junkie, geography-freak, God-fearing, Editor-in-Chief of company newsletter, a band vocalist, music lover, plays the guitar and keyboard, certified Kapamilya, the eldest of three handsome hunkie boys (LOL) and an aspiring lawyer (a certified lawstude). But since studying law at night and working as a nurse at daytime has ruined his outdoor-ish lifestyle, he has chosen his priorities ending up his journey at the law school (temporarily). After several semesters at the law school giving him more free time and setting aside reading all those thick books of the law and jurisprudence, he started his travel blog where he documented all his travel experiences. He used his free time wisely for traveling and blogging. Traveling is his first love so it is his priority because it makes him feel contented and satisfied in traveling while blogging is his outlet making him feel less stressed. Edmar works 8 hours a day, 6 days a week with 1 day off a week but he can still manage to blog and travel at the same time. I started blogging because of my love of talking. I am shy-type, a bit melodramatic but once I get my momentum, plus a topic I love most, I talk a lot. Because I hardly get a time to talk about the things that I love due to the reason that I can't seem to find a person with the same species like me who would listen and interact with me, I started my blog to unleash all the semi-overflowing ideas in my mind. This blog started as personal blog of anything under the sun until I decided to make it purely about travel and lately I also made my own food blog, entertainment blog and motorcycling blog. What is your inspiration behind your blog and how long it is around? 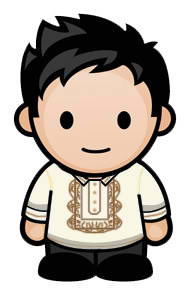 My inspiration in blogging would be the beauty, amazing culture and exciting destinations in the Philippines. There are a lot of them to see and putting up a travel blog to document them would be the best way I know to promote them. Edmaration.com was born on February 27, 2011 out of scratch. I have a lot of advice and tips. Blogging is not only confined about "passion" because that is the first thing you should have when you want a blog, meaning, that should be given for a blogger. Aside from passion that has been given as a "cliche" reason when someone asks how to succeed in blogging, there are a lot of things a blogger must do to succeed and I am particular about the branding and technicalities. 1. Be a reader: (I am giving all these pieces of advice as a 'reader' and not a blogger.) I read many blogs a lot, and we also need to be a reader at times, not purely be a blogger. Being a reader will make you learn a lot and to compare which is better. So when I blog hop, I can see that this one is better, or that one is more helpful wherein I may also apply to my blog. So for the following pieces of advice, I will be sharing my advice as a blog reader and not as a blogger per se. 1. Don't be hypocrite: Be true to yourself: Don't appear as if you don't want to be famous or to earn via blogging (unless you really don't want it, which I doubt :p). There is nothing wrong about that! One thing that could be bad is that when you are pretending as if you don't want to be famous or to become financally able via blogging. Your readers will love you for being true to yourself but please don't blog as if you are famous or rich all the time, duh. So where is the passion for that matter? I told you passion should be given and must be constant if not accelerating. 2. Create branding: Branding is important. Your brand is like your name. Offer something that will make your blog unique. Think of something that will make your blog be remembered. Like for example, a food blogger that goes to restaurant with a cat, a travel blogger that is focused about low-rise mountains, a mom-blogger that travels with kids without her hubby or anything that will make your blog unique. It pays to be creative and unique. Don't say you don't need branding, in the long run you will need it. Although you might succeed by becoming generic, just think about the success of Colgate, Coke, Pampers and Payless. They all have a brand and they just don't simply market themselves as toothpaste,softdrinks, diaper, and instant noodles, they market for their brands. 3. Give readers a reason to like you, don't force or ask them to like you. Sometimes this is a challenge. Forcing or asking others to read your blog by sending them your links via PM or any other means like tagging them in your facebook all the time you have a new post or mentioning them in twitter all the time without being asked to do it could make you appear frustrated in gaining traffic and readers. Although it is not really bad to do it, but doing it everytime you post a new article could be annoying. Calm down, do it when it is really "needed." Doing it all the time can annoy your readers or friends. So how can they like you for that? Just blog quality posts and in the long run, readers will chase after your blog. 4. Be friendly and humble: Don't act as if you are better with this blogger or that blogger. The thing is, we have different niches, different type of audience, etc. Blogging is a community and the more you become friendly and humble, the more people will love you. The more friends you have, the better. Harhar! Talagang naka-bold ang "the eldest of three handsome hunkie boys" haha. Thanks mommy Tess for featuring me and for that ego-modifying intro. LOL! This is also one of my favorite travel blogs as he knows his advocacy and go on accomplishing it one time at a time. Edmar gives the little town their much needed exposure. Ed is on the spotlight! Well deserve, We always look forward to read his blog as he always feature something not mainstream with slight punch of his antic lines. Thanks for featuring this blooger and his nice blog. I agree! I have already bookmarked his page for easy access if me and husband is going on to a travel. Congratulations on being featured. Congrats to Edmar! He truly deserve the feature. Sana ma-feature din ako, hehe. He sounds like a sensible guy, sorry to admit I haven't read his blog yet. Thanks for featuring him. I have to agree with what he said about not being hypocrite we all in the back of our minds want to be famous one way or the other and there is nothing wrong in desiring to earn good money from this! Those where a couple things people were criticizing me about from my talk in iBlog7 before such hypocrites haha. I love this blog as well. I love how he present all the places he visited already. He deserves the spotlight. Kudos! Nice feature! I am a fan of his blog. Galing ng write ups and super duper informative!!! Kudos Ed! Congratulations on being featured! You really deserve it. Yes, Ed's blog is quite interesting and informative. The tips for bloggers are really nuggets of gold! Salamats mga chong! Lalo na sa PTB Family and of course, FBW Family! I like reading Edmar's blog. =) I'd have to agree that tagging in fb is sometimes annoying, you really have to give your readers a reason to like you, you shouldn't force them. Plus 1 to Edmaration. One of the best local travel blogs. It always features little known or even unknown towns in the country. Interesting and informative. Wow, I just read his blog yesterday because I like his experienced going outside and explore the world. I want to do that too, but sad to say, my traveling buddies are not here because they are still studying on their respected schools. I agree to all advice! Especially that last advice. Mahirap makipagcompete sa ibang bloggers lalong lalo na sa mga selfish na mga tao na walang magawa kundi maki-away sa ibang bloggers. I've always liked Edmar's blog, so congratulations on his well-deserved feature! :) Anyway, love all the tips he gave to new and even to old bloggers. I definitely agree to all of them! Congratulations Edmarton. I like to read stories of success. Enjoying your blog BTW. interesting article... im one of this blog.. I want to Feature my Blog also. Just browsing over all the featured blogs to see if I can get some tips for better blogging. I am very familiar with this blog and I can say that it serves its purpose quite well. WAY TO GO EDS!! I am so proud of you!! !MOre Blogs to COme..more travel inspiring stories, more exotic places and foods to feature..hopefully not just in the Philippines but other parts of the world someday! !GOdbless my dear friend and brother! !